You’ll read elsewhere about the decision we’ve made to cease operating our Hope Training department at the end of July this year. As I sat with the training staff team and broke the news to them last week, this scripture, from Ecclesiastes Chapter 3, was pointed out to me. Not surprising that it came to mind, as it is painted on the wall of the Drop-In surrounding a ‘tree of life’ piece of art work. 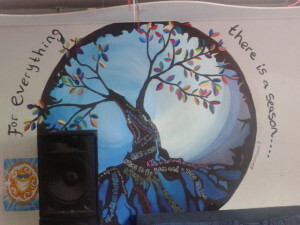 Poignant perhaps as it had been painted as part of an Art project during Hope Training. As a Christian organisation, the idea of things happening ‘in seasons’ is something which we are perhaps better tuned in to than our secular colleagues. We recognise that every activity has a season – there is a time for everything, and each thing comes to an end. Whilst it is difficult and hard to finish things, knowing when it is right to finish something – when its season is over – is an important skill. Hope Training, and its predecessor Tranzform Training, has provided amazing opportunities for young people to learn skills, develop confidence, gain qualifications or accreditation, and move on in their lives. This year too will see the latest, final, cohort achieve and move forwards. But the past is not somewhere that we ought to dwell. We need to exist in the present and be conscious of our future. There is a saying “As one door closes, another one opens” At The Door we realise that is as true for us as it is for the young people and families we support. So, as we close one door with some sadness, we equally look forwards to others opening before us.